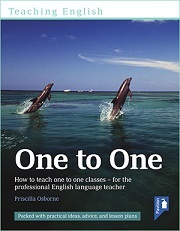 The first edition of Priscilla Osborne’s excellent guide to 1-1 teaching was published in 2005 and it has recently been updated and republished, both as a physical book and an e-book. Make this part of your professional development in 2016 if you haven’t already. This entry was posted in Lesson ideas and examples, Teaching tips, Useful resources and tagged 1-1 teaching, Books, Essentials, Professional development, Teaching basics. Bookmark the permalink.